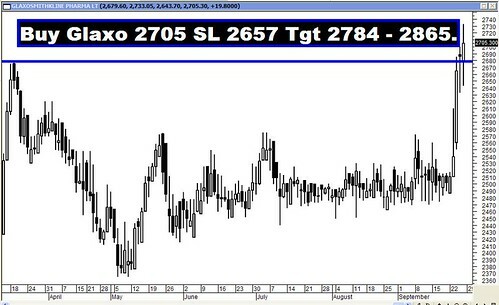 Archives : 50DMA TO THE RESCUE - 26/09/2014. 50DMA TO THE RESCUE – 26/09/2014. It was a dismal week to say the least, but the last hour on Friday changed everything. The Bulls made a roaring comeback on the announcement that the Rating agency S&P upgraded India Outlook to Stable from Negative on the back of improved political setting and a more conducive environment for economic reforms, thus providing a boost to growth prospects and improved fiscal management. Both the indices bounced back from the support of the lower boundary of Rising Channel formation, aided by the medium term average of 50dma to cut short a three day fall. Sensex opened the week at 27008, made a high of 27256, low of 26220 and closed the week at 26626. Thus it closed the week with a loss of 464 points. At the same time the Nifty opened the week at 8084, made a high of 8159, low of 7841 and closed the week at 7968. Thus the Nifty closed the week with a loss of 153 points. Nifty rebounded sharply in the last one hour of trade witnessing an increase of more than 100 points from the lows of the day and in the process snapping a three day fall. But still both the indices failed to register a Bullish Reversal candlestick pattern on the daily charts. Both Sensex and Nifty made a white body candle almost like Thrusting which is a bearish continuation pattern. On the weekly charts both the indices have formed a black body candle with long shadows. Thus both daily and weekly candlestick pattern suggests continuation of bearishness in the short term. The weekly gap between Sensex 26732-26674 and Nifty 7984-7968 got filled this week and hence the target of Sensex 28174 and Nifty 8412 as per gap theory, stands negated. On the lower side, there exists a critical Bullish Rising gap on the daily charts between Sensex 25437-25406 and Nifty 7598-7592 which aided by an intermediate bottom (Sensex 25232 and Nifty 7540) and 38.2% Retracement of the intermediate rally (Sensex 25415 and Nifty 7591), forms a strong confluence zone. Thus this confluence zone formed between Sensex 25437-25232 and Nifty 7598-7540 will act as Support Zone. In the short term, the markets are correcting the upward rally from an immediate low of Sensex 25232 and Nifty 7540 to a high of Sensex 27354 and Nifty 8180 and the relevant Correction levels are at Sensex 26544-26293-26043 and Nifty 7935-7860-7784. This week the markets have taken support at the 50% Retracement level and rebounded. It will be an interesting next week which will tell us whether this support holds or not. The short term trend for the market is already down but the medium term trend is likely to reverse if the Nifty closes below 7540 and Sensex below 25232. The market has already achieved the Rounding bottom target of Sensex 27081 and Nifty 8145. Now it is headed towards next target which is Flag pattern target. The target for this pattern is at Sensex 27828 and Nifty 8304. The targets will be achieved as long as the Sensex remains above 26262 and Nifty above 7855. This week, both Sensex and Nifty have managed to test and take support at the medium term average of 50dma (Sensex – 26377 and Nifty – 7885). Whereas both the indices continued to remain below the short term average of 20dma (Sensex – 26940 and Nifty 8062) and remain well above the long term average of 200dma (Sensex – 23501 and Nifty – 7013). Thus the trend in the short term remains down, whereas the trend in the medium term and long term timeframe continues to remain bullish. MACD and ROC both continue with their Sell signals. RSI is below the equilibrium line suggesting bearish momentum. MFI has reduced further to 28, suggesting money flowing out. ADX has reduced to 24, suggesting a decrease in the strength of uptrend. Directional Indicators are now in Sell mode as +DI has gone below –DI. OBV has moved lower but is still in sideways mode. Bollinger band has given a Sell signal on Thursday when the Nifty closed below the lower Bollinger band. Thus Oscillators are suggesting a bearish bias in the near term. Option data suggests that highest Put Open Interest build-up is at the strike of 7800 and highest Call build-up has shifted to the strike of 8200. Thus Option data suggests a short term trading range with support coming in at 7800 and resistance around 8200. Strong Trendline Support for the Sensex is at 26126. Trendline Resistance for the Sensex is at 27732. Strong Trendline Support for the Nifty is at 7833. 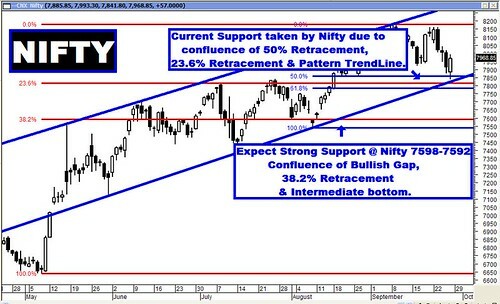 Trendline Resistance for the Nifty is at 8304.